Practical Single Handed Knight Swords for sale are 36 ½ inches in all. The blades are non-pointed, un-edged with 1/16th inch wide edges and a round tip making them popular for reenactment and stage combat. The fully tempered 30 inch functional blade features a fuller. The 1065 high carbon steel blade is hardened to 50HRC. The hardening process helps to permit for edge notching only to acceptable levels. Additionally, this process provides resilience and helps to protect against brittleness. They have a 6 ½ inch handle length and weigh 2 pounds 7 ounces. The thickness at the guard is 0.230. The glass-filled resin scabbards have adjustable belt rings for vertical or horizontal carry. 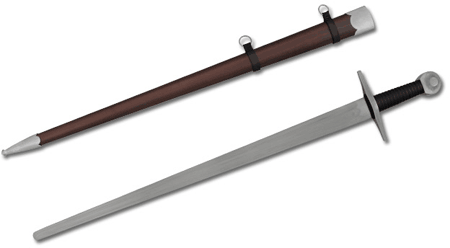 Buy the Single Handed Knight Swords for reenactment or stage combat for $189.99.